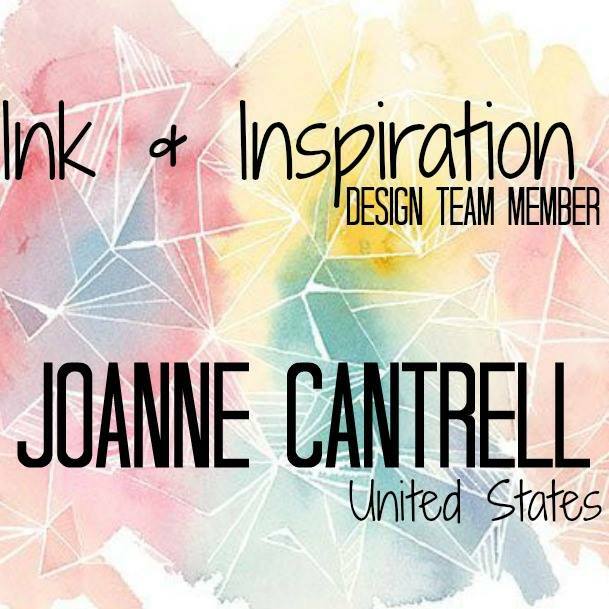 Welcome to this installment of the monthly Ink & Inspiration Blog Hop. You are currently visiting Joanne Cantrell from the very bottom of Illinois , USA. I hope you are inspired by my Wedding and Anniversary cards that I have created just for your view and CASEing pleasure. I will say up front, my go to wedding set is the Rose Wonder stamp set and the Rose Gard dies. But, since I had lent that to a team member the other day, it wasn’t with me when I created my cards for this hop. So, I did some quick thinking and a little scouring of Pinterest to come up with these two. 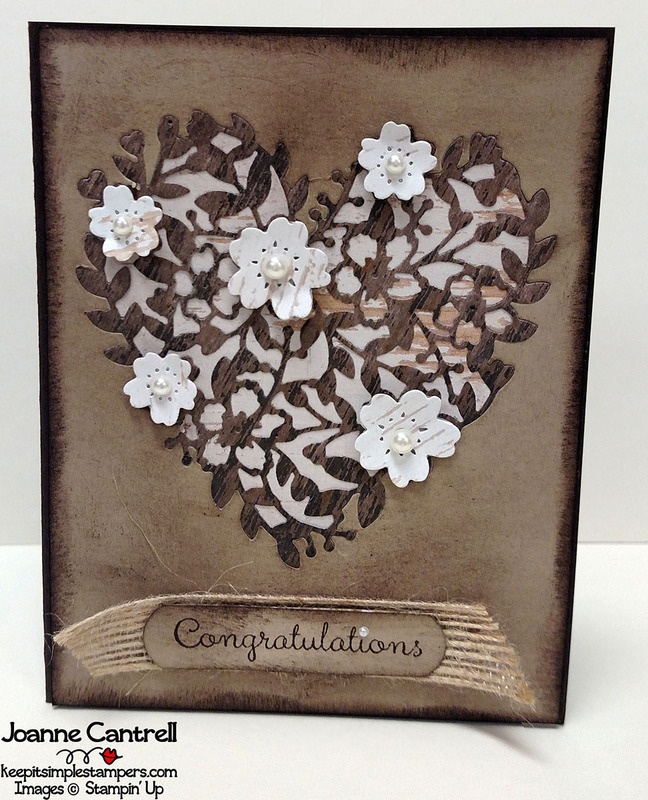 This first card uses the Bloomin’ Heart Thinlits Dies (140621) and the Wood Textures Designer Series Paper Stack (144177) to create a woodgrain inlay. I also placed a different pattern behine the inlay and used that same woodgrain to cut out the flowers. The sentiment is from the Special Celebrations Stamp Set (143882/143885). I think this would be perfect for the couple that is having a more rustic type wedding. It’s not so far out of the norm but not your regular white and bright color combo. This next card is also a little less traditional. 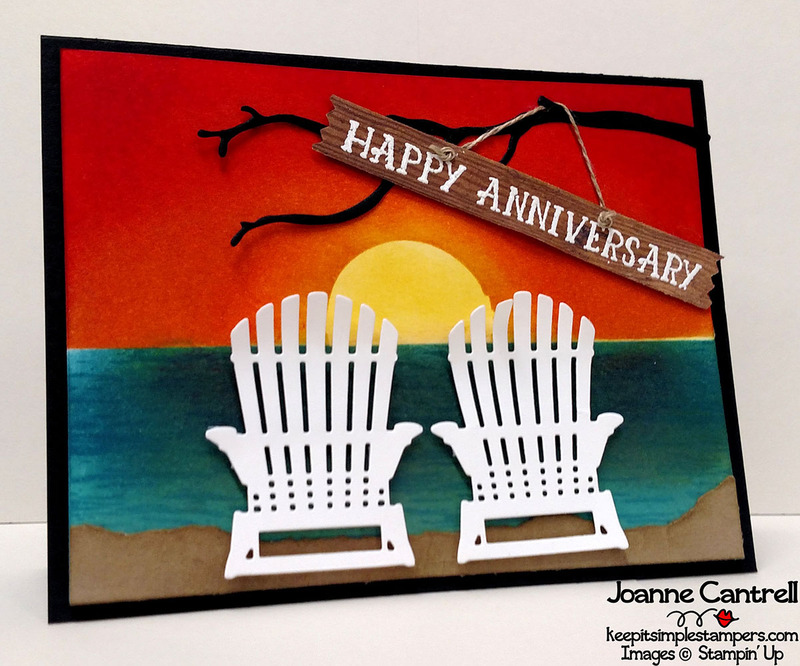 Here us used the Seasonal Layers Thinlits Dies (143751) to add the chairs and the branch. They were placed against a sponged background. The waves were added using the High Tide Stamp Set (143006). The sentiment is from the Number of Years Stamp Set (140653). I simply stamped it in VersaMark (102283) on a scrap of the Wood Textures DSP then embossed in white. I used the 1/16″ Circle Punch (134363) to punch the holes for the Linen Thread (104199) to go through. 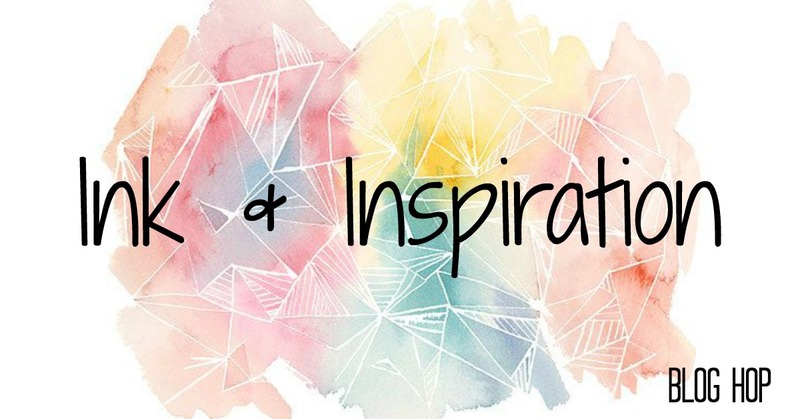 I hope the projects you’ve seen here on my blog today have inspired you & brightened your day. You are currently visiting Joanne Cantrell. Please see the list below & hop through all of the people on the list to see all our projects. You don’t want to miss any! I love these cards, especially the first one! Tfs! Both cards are just gorgeous! Thanks for sharing!